The cooler weather is here and I'm just loving it! I've started to decorate for autumn both inside and out. 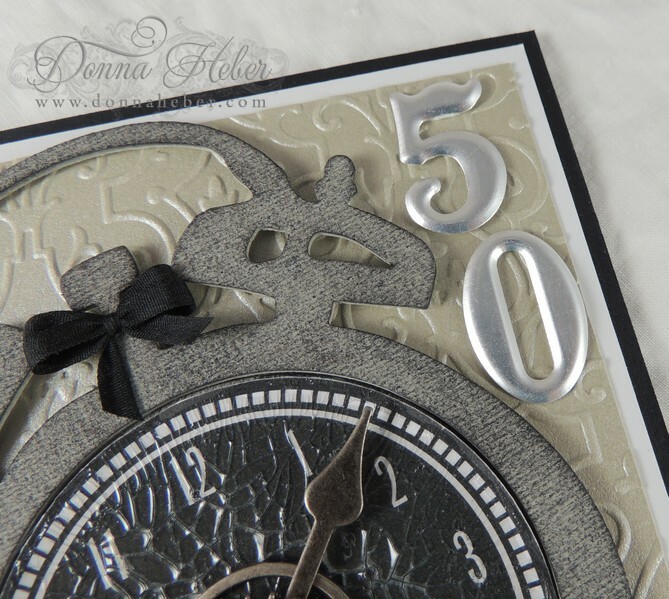 I have a card to share with you using the Tim Holtz Tick-Tock die. I started with a black linen card then layered a piece of Whisper White and Coredinations Silver Pearl paper. The silver paper was embossed using a Cuttlebug Anna Griffin Foundry embossing folder. 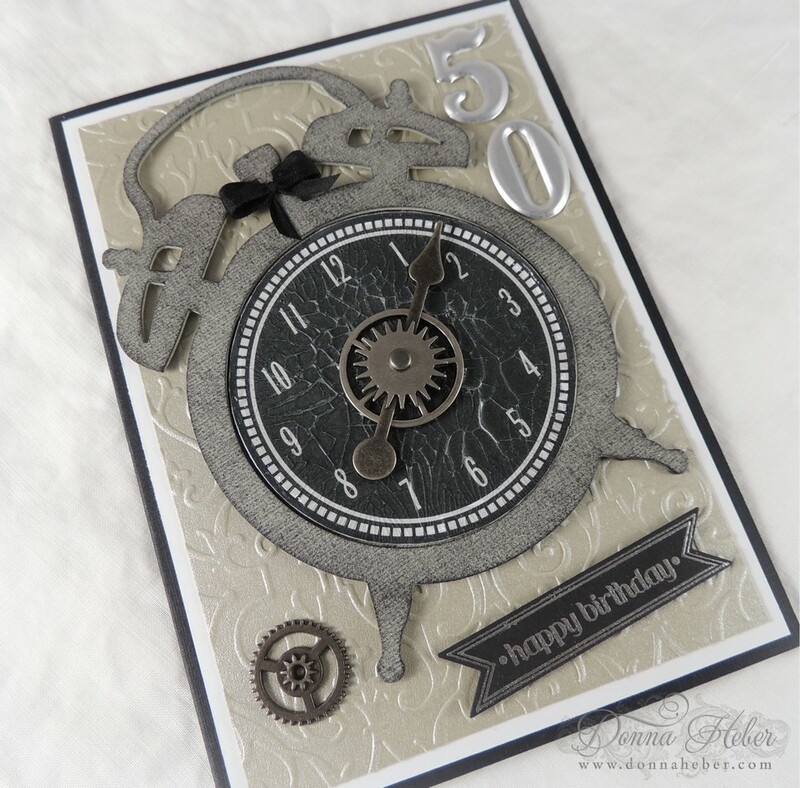 Using the Tick-Tock die I cut a piece of grungeboard and sponged it with Distress Black Soot ink. The face of the clock is Teresa Collins Timeless paper. To give it a "worn" look I covered it with Inkssentials Crackle Accents and let it sit for a few hours. The combination of an idea-ology sprocket, game spinner, mini gear and brad adds to the masculine look. A banner was created with Basic Black paper with the Framelits Bitty Banners die. 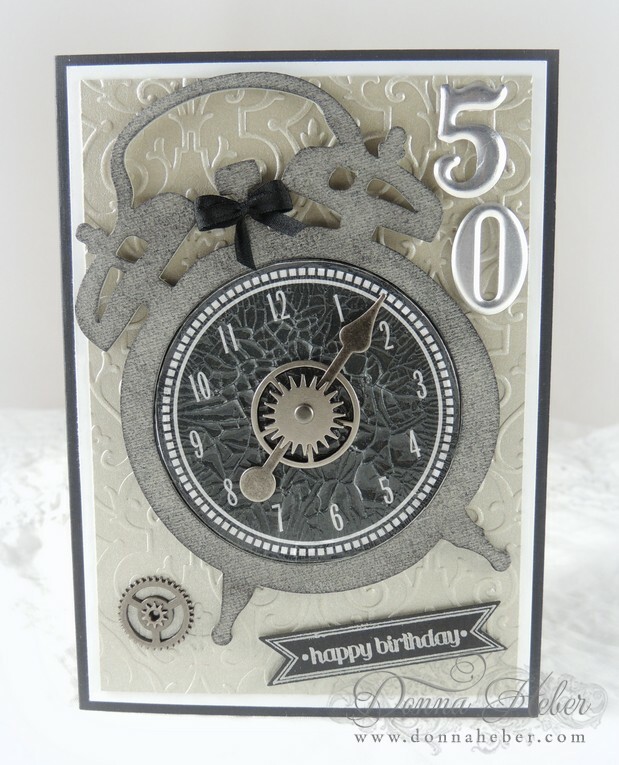 Happy Birthday was stamped in VersaMark and embossed with silver embossing powder. To finish the card I glued a mini gear in the corner and a bow on the clock. The numbers 50 were popped up with dimensionals. 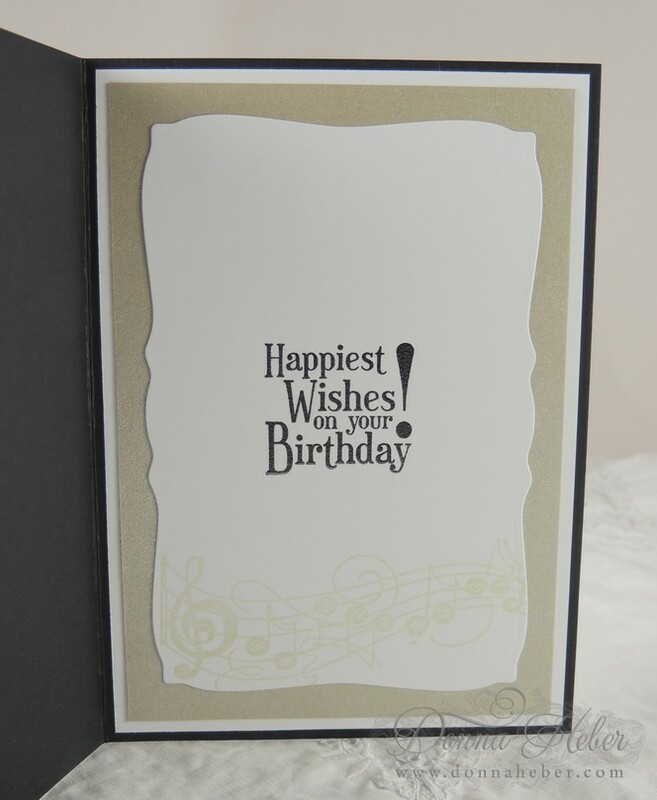 The inside sentiment was stamped in StazOn Black and embossed with clear embossing powder. To create the musical border, which is hard to see in the photo, I first stamped the image in Brilliance Platinum Planet then stamped it again with Adirondack Juniper. I was thrilled that the colors matched the silver pearl paper. I hope whatever you did this weekend you had some time to be creative or enjoy the great outdoors. I really love the raised design on this one, Donna. Very beautiful, and so perfect for a birthday. I wish you a bright beginning to your week! it's a very beautiful card Donna. What a fabulous Birthday Card Donna. Love the clock. The metal pieces on this card are fabulous! Your card has a kind of steampunk feel to it. Awesome! Beautiful job! The metal pieces sure add a finishing touch.